I love books with pretty pictures. I think nearly all quilters are suckers for a pretty book, due to our visual nature. This one is incredibly appealing on that level. The patterns featured range from the humble one-patch to appliqué, improvisation, and complex piecing. The instructions seem fairly easy to follow, although I would not give this book to a beginner as a how-to guide. 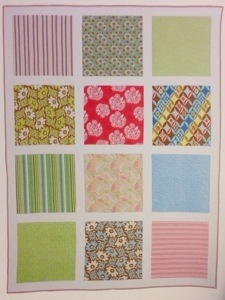 The concept is simple: choose twelve fat quarters you love, square them up, add sashing, and quilt as desired. 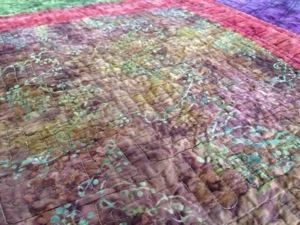 The quilt was an excuse to practice my developing free-motion and straight-line machine quilting skills. 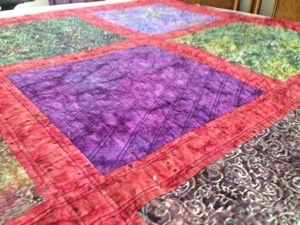 Each block features a different quilting pattern. 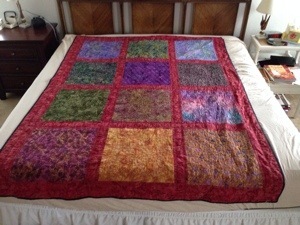 Despite its simplicity, or maybe because of it, this remains one of my favorite quilts. Do you have this book? If you do, I would love to see something you’ve made from it! Or, conversely, you can tell me why you think this one is not one of your Keepers. 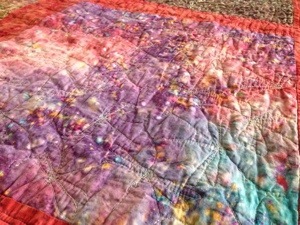 This entry was posted in Quilting and tagged (Stash)BUSTED!, books, fabric, keeper, organization, Quilting, review. Bookmark the permalink.